I can’t quite remember how or when I was first introduced to the notion of a radish sandwich, so I would not be surprised if you, too, found it unusual. It is popular fare in France, however, where French breakfast radishes are simply sliced atop white bread with butter and salt. (They are also popular in Montréal, where my father grew up eating them.) The sandwiches can also be served deconstructed on a platter with radishes, butter, salt, and sliced baguette for guests to create their own; this makes an elegant hors d’oeuvre that no doubt introduces guests to something new, at least here in the United States. 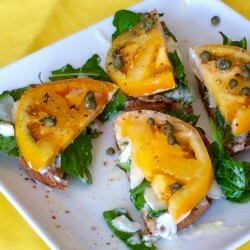 People always think of tomatoes when it comes to crostini, and goodness knows I’ve made tons of those over the years. Yet, ever inspired by radish roots and leaves, I recently created my own take on the French radish sandwich by serving mixed radishes atop crostini with garlic and herb butter. Some also included a few sautéed radish greens to bump up the nutrition and flavor profile. 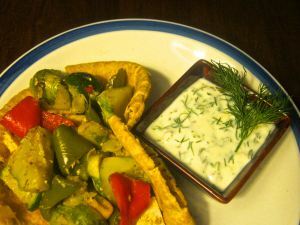 Today is the right day to share the recipe with you in light of my recent trip to Montréal. As well, if you live in the northeastern US, radishes are currently in season and lots of different varieties can be found at your local farmers’ market, if you’re lucky. 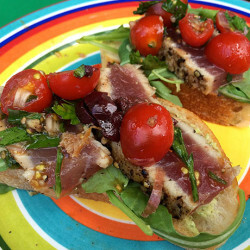 I encourage you to think beyond the tomato and give this satisfying recipe for radish crostini a try. 1. Make the herb butter. Mix crushed garlic, chopped parsley and chives, and a touch of EVOO into softened butter. 3. Prepare crostini. Thinlly slice a French baguette and brush with olive oil. Toast in a hot oven (425F) about 8-10 minutes until lightly browned and crispy, turning over half-way through. 4. Sauté radish greens in a bit of EVOO with a touch of salt, garlic, and black pepper, just as you would any other green. (Raw greens are pictured.) You could certainly also use raw greens if you’d rather, I just felt like cooking them for some reason. 5. Assemble the crostini. 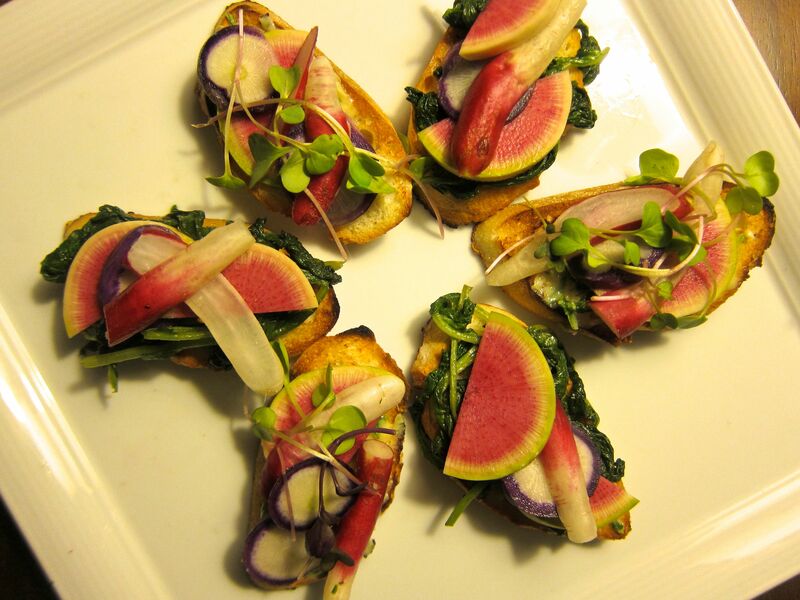 Spread a bit of butter on each crostini then top with a few sautéed greens and radishes. Next, sprinkle each with a bit of kosher or other large-flaked salt; this is an important step that really brings out the flavors. For presentation and variety, I served half with cooked radish greens and half with raw microgreens; both were delicious. So, perhaps you’ve never heard of French breakfast radishes, let alone radish sandwiches or radish crostini. But, seriously, what’s not to like about sweet and crunchy radishes, creamy garlicky herb butter, and crisp French baguette? oooooooh ma gaaaaaaaaad! looks so delicious!!! would be equally as delicious as a sammie, no?